The doctor is like many people in Syria who are on their last emotional or physical legs as they face a complex, brutal, seemingly endless crisis. And now, according to a new report from the International Rescue Committee (IRC), published Thursday, those who want to leave Syria are increasingly finding themselves trapped. U.N. High Commissioner for Refugees António Guterres has called the outflow of Syrian people from their war-ravaged country “the biggest humanitarian emergency of our era.” This week, UNHCR announced the latest numbers: Approximately 7.2 million people have been forced to flee their homes within Syria, and 3.3 million have become refugees abroad. 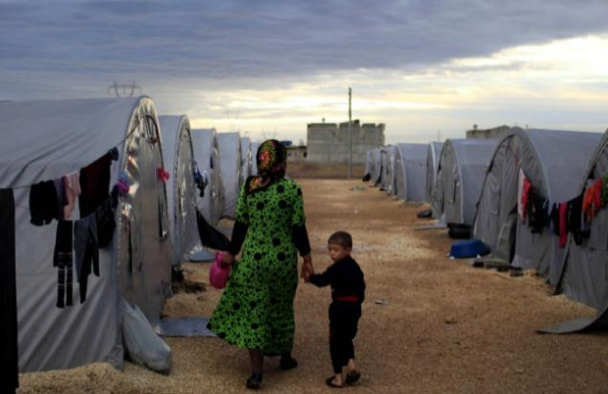 (UNHCR estimates that, in total, 13.6 million people have been displaced by fighting in both Syria and Iraq.) The IRC’s report adds a startling dimension to these statistics: UNHCR registered an average of 150,000 refugees leaving Syria each month in 2013. For the first three-quarters of 2014, however, the number fell to about 78,000 per month. Then, the kicker: In October 2014, the number of people registered by the U.N. as leaving Syria fell to just 18,453. That’s an 88 percent drop from the 2013 monthly average. The number isn’t shrinking because fewer people are trying to flee. Rather, according to the IRC, people are either unable to leave cities under siege — there were high levels of conflict in Syria in October — or they are being turned away at the borders of neighboring countries as tighter restrictions are put into place. To read the rest of this article, please click over to Foreign Policy.